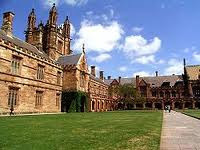 The University of Sydney takes great pleasure in announcing the Sydney Achievers International Scholarships for new international students commencing at the University in 2012. 30 scholarships of AUD$10,000 each per annum, available for a maximum of three years, (total value AUD$30,000) for any Undergraduate program offered at the University of Sydney (subject to the recipient maintaining satisfactory academic progress each year). Students who have already commenced tertiary studies, or students transferring with credit exemptions and/or advanced standing are not eligible. Students completing Foundation Studies Programs are also not eligible. * For further information on equivalents to Australian Year 12 qualifications and a table showing standard academic requirements for some of these examinations relative to ATAR scores see official website. 30 scholarships of AUD$10,000 each, available as a one-off award (total value AUD$10,000) for any Postgraduate Coursework program offered at the University of Sydney. Applicants must have completed the equivalent of an Australian Bachelor degree qualification with a minimum high distinction average as based on the Australian grading system. Students who have already commenced postgraduate studies, or students transferring from other postgraduate programs are not eligible. No separate application for a scholarship is necessary. An Application for Admission to the University of Sydney in 2012 will constitute an application for a scholarship. All applications meeting the selection and eligibility criteria will be automatically considered. The deadline for receipt of applications and complete supporting documentation (academic and English language proficiency results) is 31 October 2011 for Semester 1, 2012, and 30 April 2012 (for Semester 2, 2012). Applications received after these deadlines will not be considered. Selection will be based strictly on academic merit as per the University’s admission requirements. Selection will be based on actual results (academic and English language proficiency). Predicted/forecast results will not be considered. Selection will be made by the University’s Scholarship Selection Committee, whose decision will be final. No appeals will be entertained. Successful candidates will be informed in December 2011 (Semester 1, 2012) and June 2012 (Semester 2. 2012). Successful candidates applying through UAC will be informed in January 2012.